Traditional Wet and Dry Vacuum Cleaners are often compromised, when trying to perform both wet and dry activities. 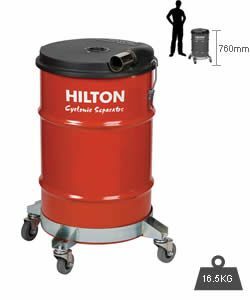 The addition of a HILTON Cyclonic Separator extends the waste handling capability of your vacuum cleaner without that problem. Choose from 2 Cyclonic Head options, 4 different Body options and 2 Auto-Empty mechanisms for the setup that simplifies your waste handling processes in both wet and dry situations. Double Your Filtration – Even very fine dust is no problem. you will clean more, stop less, and extend the working life of your vacuum filters. Double your capacity – Have the freedom and flexibility of the waste handling capacity you need with the cyclonic separator in either 60Ltr or 210Ltr options. Waste Handling, Wet & Dry – Handling wet and dry waste has never been so quick or easy. In conjunction with a HILTON vacuum you have a wet and dry vacuum cleaner on steroids.